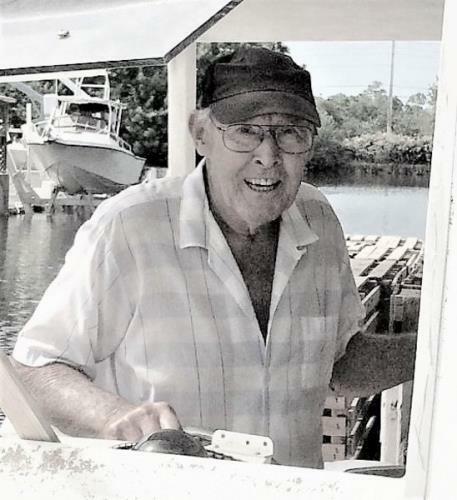 Edward (Ed) Joseph Baldwin, 83, of Big Pine Key, Florida, passed away peacefully on Thursday, November 30, 2017, surrounded by his loving family. He was born on Sept. 3, 1934, in Runnemede, NJ to the late John C. Baldwin, Jr. and Catherine M. Baldwin and shortly after the family moved to Miami, FL. He grew up there hunting and fishing in the Everglades and the Keys with his many cousins while he began a career as an ironworker helping to build many skyscrapers in the Miami Beach area. He married VeEtta Jane Keagle in 1956 in Miami Springs, FL and they had 61 wonderful years together. They traveled frequently and loved camping throughout the US, Canada and Alaska enjoying each other, their family, the scenery and the wildlife. He moved the family out of Miami to Big Pine Key in 1971 to enjoy a more peaceful life and get out of the rat race. He began commercial fishing for lobster and continued fishing until 2015, always loving to be on the water. Mr. Ed, as he was affectionately known, was a quiet man of few words and a keen sense of humor. He was a man of honesty and integrity and believed a handshake deal was as good as any written contract. He was a masonry contractor and certified welder who had a knack for building and fixing anything and helped many people with his wonderful talents. Ed loved his girls dearly and is survived by his wife VeEtta; his three daughters Valerie Sue (Raymond) Fecher, Vicki Lynne Baldwin and Vivian Leigh (Christopher) Etmanczyk; his only grandchild Ryan David Jachowski; his siblings John C. (Mary Grace) Baldwin, III and Katherine (Leslie) Nelson; and many nieces and nephews, aunts and cousins. All arrangements are entrusted to Allen-Beyers Funeral Home in Key Largo, FL and his ashes will be scattered in the places he cherished the most: the waters off the Florida Keys; the Everglades; the Rocky Mountains and the Kenai Peninsula in Alaska.